Podiatrist Dr. Ali Sadrieh and his patient Schanel are interviewed for a segment on hammertoe. The segment includes footage of Dr. Sadrieh using the PRO-TOE™ VO Hammertoe Fixation System to correct two hammertoes on Schanel’s feet. Just two days following surgery, Schanel’s toes are notably shorter and straighter. The opinions of Dr. Sadrieh are his alone and do not necessarily reflect the opinions of Wright Medical Technology, Inc.
Ogden resident Duane Christensen and his physician Dr. Jeffrey Rocco were interviewed for a segment on total ankle replacements as a treatment for severe arthritis. Duane received the INBONE® Total Ankle Replacement to alleviate progressive and debilitating pain in his right ankle that made walking all but impossible. The opinions of Dr. Rocco are his alone and do not necessarily reflect the opinions of Wright Medical Technology, Inc.
Medical Reporter Jeremy Cox at the Florida Times-Union interviewed Dr. Ryan Pereira at Anastasia Medical Group for his weekly Health Caring podcast. Dr. Pereira discussed INBONE® Total Ankle Replacement by Wright Medical and explained how total ankle replacements have gained in popularity over ankle fusion because of improvements in the design of ankle implants, which allow for more ankle mobility and better patient outcomes. 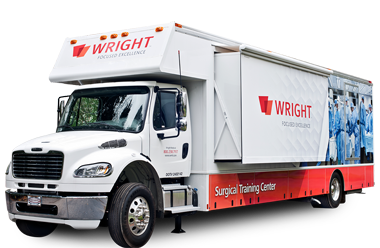 In this Panama City News Herald story, Writer Chris Segal reports on the INBONE® Total Ankle Replacement by Wright Medical. Dr. Shayne Jensen of Gulf Coast Podiatry Foot and Ankle Surgery Center in Panama City, Fla. explains how the INBONE® Total Ankle Replacement uses an artificial prosthesis to offer patients suffering from ankle pain better mobility without the restricted movement that results from an ankle fusion procedure, another treatment option for ankle issues. Dr. Jensen’s patient Mike Mead says that he has been impressed with his progress since his total ankle replacement in July, noting that he has been able to resume his daily, mile-long walks, which at one point became impossible due to his ankle pain. Health Reporter Dr. Joette Giovinco of WTVT-TV (FOX) in Tampa speaks with Dr. Nathan Penney about the benefits of the INBONE® Total Ankle Replacement from the operating room. Dr. Giovinco also speaks with patient James Triplett who received his INBONE® implant in February 2010 and is walking around without severe pain for the first time in years. This article in the Tampa Tribune details the story of local resident Jim Triplett, whose left ankle healed improperly after a car accident three decades ago. As the years went by, his ankle deteriorated, forcing him to give up some of his favorite activities, such as golfing and bowling. Jim was implanted with the INBONE® Total Ankle Replacement earlier this year and was back at work within 10 days and back on the driving range a few months later. In the article, his surgeon, Dr. Nathan Penney at Total Foot and Ankle of Tampa Bay, talks about why he uses INBONE® for total ankle replacements. Ocala Star Banner reporter Jackie Alexander reports on the first INBONE® procedure performed in the North Central Florida area by Dr. Robert Linn Jr. and Dr. Scott Goldstein at the Foot and Ankle Center of Ocala. Dr. Linn explains that individuals ages thirty to eighty can be candidates for the surgery, but high impact activities such as tennis or basketball are discouraged after surgery. Dr. Linn also states that the procedure enables individuals to return to a normal routine upon recovery. Drs. Linn and Goldstein are photographed at their practice with a post-operation x-ray of their patient’s ankle. This segment that aired on the NBC affiliate in San Antonio, Texas highlights INBONE® Total Ankle Replacement patient Ron Siliven and the improvement in his quality-of-life after his ankle replacement procedure. In fact, Ron states that his new ankle allowed him to dance with his wife for the first time in three years. Dr. Marvin Brown of The San Antonio Orthopaedic Group is also featured in the segment and notes that for many patients, INBONE® is an improvement on ankle fusion. In this June 29th article, Dr. Gary Schmidt of St. Louis explains how far the technological advances for ankle replacements have come over several decades as a viable option for patients suffering from ankle osteoarthritis. Dr. Schmidt discusses how the INBONE® Total Ankle System is his preferred treatment for severe ankle pain caused by arthritis. This June 29th article, in the Reading Eagle, features double INBONE® Total Ankle Replacement patient Marjie Baer and her experiences with ankle osteoarthritis. Marjie explains the limitations she endured in her family and social life because of her arthritic ankles and how the INBONE® Total Ankle Replacement gave her back her life. This segment on total ankle replacements aired in May on the NBC affiliate in Columbus, Ohio. Reporter Marshall McPeek speaks with Dr. Thomas Lee’s patient, Tammy Cyrus, who shares her happiness at being able to once again enjoy activities that many people take for granted, such as shopping, cooking for her family and walking in the park. Dr. Sanjay Gupta reports on how the INBONE® Total Ankle Replacement helped patient Timothy McAvoy return to golf and other activities that he had to quit due to ankle arthritis. Also in the story, Dr. Steve Brigido talks about how INBONE® ankle replacement has helped patients return to an active life style. The story was aired on nearly 80 local newscasts around the country, including the ABC affiliate in Austin, Texas. This Saturday Evening Post article details how advancements in total ankle replacement technologies, including Wright’s INBONE® implant, are helping those with severe arthritis get back on their feet. Patients Jeanne St. John and Timothy McAvoy describe how severe arthritic pain in their ankles limited every aspect of their lives, and how the INBONE® total ankle has enabled them to return to their favorite hobbies and activities. This January 19th New York Times article discusses the technological advancements and growing popularity of total ankle replacements. It also features an INBONE® Total Ankle Replacement patient Andrew Keaveney and commentary by Dr. Craig Radnay of the Insall Scott Institute for Orthopedics. The article details which patients are best candidates for the procedure as well as the improved success rates with improved design. Lifestyle benefits, such as a return to walking and golfing, are also mentioned as benefits of ankle replacement. This article, in the South Bend Tribune, features INBONE® Total Ankle Replacement patient Harry Platt and his experiences with ankle osteoarthritis and ankle replacement surgery. Harry explains how his constant arthritic pain was limiting every aspect of his life and how the INBONE® Total Ankle Replacement is helping him return to all of the activities he loves.